Try as you might, sometimes it's hard to get aging cats excited about eating. Thanks to higher standards of care, cats are living longer than ever. As they age, cats often lose their appetite to some extent. If it's serious, visit a veterinarian to rule out medical causes. Barring those, there are some simple changes you can make to help your cat eat more. A variety of medical conditions can cause your cat to eat less -- everything from the common cat cold to feline HIV. Cats' appetites naturally decline as they get older, but it's usually a gradual process, not an acute loss. Older cats are more susceptible to most diseases, so it's important to schedule an appointment with a veterinarian at the first sign of behavioral changes, including appetite loss. 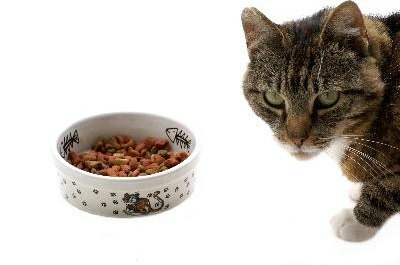 Once you address the underlying condition -- assuming it's not just old age, which isn't really a medical issue -- your cat should regain her appetite. Your cat may not be eating because it's painful. Although you should consider health issues, Mitten's reluctance to eat is more likely caused by the discomfort of dental disease, according to the American Association of Feline Practitioners and the Cornell University College of Veterinary Medicine's Feline Health Center. During their lifetime, 85 percent of cats experience some form of periodontal disease, which can dramatically affect your cat's appetite if the problem remains unresolved, according to the Feline Advisory Bureau, a long-lived cat charity group in the United Kingdom. The extent and invasiveness of feline dental work widely varies. Your cat's age may preclude certain procedures or techniques, and there still may be risks. However, the end result -- pain-free eating, and more of it -- may be worth risking complications. Your cat's environment may be a key component of her appetite loss. Older cats often struggle with mobility and need special accommodations, according to Dr. Emily Levine, of Cornell University College of Veterinary Medicine. "Older cats should have easy access to food, water and litter boxes, so if they chose not to climb stairs they don't have to," Levine says. Try putting out more food and water stations for your cat in easy-to-reach areas. Consider putting ramps or similar devices around the house so your cat can get to her favorite perches, which are also good places to tempt her with more food and water. Basic food and water issues may be quelling your cat's appetite. Kidney disease aside, many older cats have poor kidney functioning. This affects many areas of health, including appetite, according to Dr. Richard Goldstein of Cornell University's College of Veterinary Medicine. "Consider mixing canned and dry food to let your cat absorb the water canned food offers," Goldstein says. Wet food is generally more appealing to cats, so try swapping dry food out of your cat's diet, if possible. Note that unlike dry food, wet food requires a regular routine and can't be left out all day. Consistent timing in this regard is especially important in senior cats, who thrive on regular routine. There are lots of ways to try and stimulate your cat's appetite. Adding tuna or tuna water to dry food often increases a cat's willingness to start eating. Its pungent aroma may stoke your aging cat's failing sense of smell -- a common feline age ailment. If you feed your cat at set times, trying feeding her less and adding another feeding session earlier or later in the day. Smaller meals with higher frequency may be more palatable to a less active cat who doesn't need a large number of calories at once. Catnip is another safe way to stimulate your cat's appetite. Not all cats react to it, nor react the same way, but many eat more after catnip exposure. Consider sprinkling some on your cats food. It's not just a stimulant -- it also helps with digestion. If none of these approaches help your cat eat more, schedule another appointment with your veterinarian. Proper diet is vital to an older cat's well-being -- perhaps even more so than their nubile brethren. Address appetite issues as soon as they come up. You may even want to schedule an appointment with a veterinarian before trying easy fixes. If your cat has regained her appetite by then, you can use the appointment to talk about addressing her long-term health and common age-related issues. Can Heartworms in Cats Affect Their Appetite? When Cats Are Pregnant Do They Eat Everything They See?